American photographer Minor White is quoted as having said “Photographs can be outward expressions of inward states. They’re not about what something is, but rather what else something is”. Expression can be defined as the act of making one’s thoughts or feelings known. This can be through any verbal and non-verbal behaviour that communicates the emotions that we are feeling at a given time. A face can say so much. It is probably the most important factor in identifying human emotions and character. Even the tiniest movement of the face can clearly convey a person’s emotional state. Self-expression is a display of individuality. Many people choose to express themselves through their clothing, hairstyle, makeup, or any other means that allows them to reflect their personality in a visual manner. Others like to express themselves through art, dance, music or the words that they use. This theme is asking you to explore the various interpretations of expression. Can you capture someone’s spirit, personality or character in a photo? How can you use expressions and emotions add depth to your photography. Can you show how you use photography as an artistic expression? My interest in photography was inspired by my father and resulted in me purchasing my first SLR, a Russian Zenith EM, back in my early teens. My career in I.T. 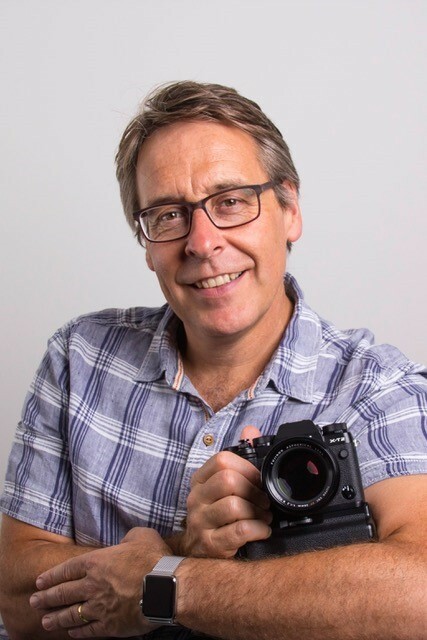 and interest in technology meant that I was keen to embrace the transition to digital and as such I was a relatively early adopter and purchased my first digital camera in 2001. However, it was the purchase of my first DSLR (a Canon 350D) for my 40th birthday and the introduction to Flickr by a friend that was the point at which my interest in photography became more of an obsession. Living in Guernsey and inspired in particular by local photographer Nick Després FRPS, seascapes became a favourite initial subject; in 2011 my work was chosen for “SEPAC 2011 – Sea Guernsey 3”, a set of six stamps by Guernsey Post, which was a great honour. Although landscape photography is still a passion , I would describe myself as a bit of a generalist and I’m equally happy photographing a busy wedding day as I am capturing the beauty of a remote landscape. One area of speciality that I have developed over the last decade is the photography of performing musicians which I particularly enjoy. Living is a small community has allowed me to gain permission to photograph some well know musical performers such as soprano Katherine Jenkins, Jools Holland and the beautiful and hugely talented violinist Nicola Benedetti to name but a few. In 2012 I became involved in local club photography, joining “Spectrum Guernsey”, one of the three clubs in our small island. I soon found myself regularly placing in club competitions and in 2014 submitted for and achieved my LPRS distinction. I have won overall Spectrum photographer of the year for three consecutive years and for my sins find myself in my fourth year as President of the club! During my time at Spectrum and involvement in the organisation of the Guernsey Eisteddfod I have learnt a great deal about what makes a good image and have become proficient in objectively judging images on their merits. This is a very colourful, beautifully lit, striking image. The expression of sheer joy and excitement in the young boy’s face has been beautifully captured and successfully conveyed by the photographer. The central composition of the main subject has worked well in this instance, with the makeup artist’s hands directing our focus and the peacock feathers framing the face on the left. The additional element of the second child’s face, perfectly framed, but pleasingly slightly out of focus, adds impact and interest as well as providing depth to the image. This portrait successfully conveys the strength of personality displayed by this woman. Without reading the title of the image, the shaved head gives us a strong cue that this lady may be battling cancer. Her expression is one of stoicism, bravery and perhaps acceptance. The photographer has chosen to use a very shallow depth of field to isolate the important facial features of eyes and lips which works well to focus our attention and read the personality. This is a wonderful wildlife image which conveys recognisable human-like behaviour of one of our primate relatives. Who could mistake this for anything other than an expression of love between mother and offspring! The photographer has been quite fortunate in that the lighting in this shot, coming in from the righthand side, has highlighted the mother’s hand and face beautifully. Composition and depth of field have been handled very well too. This is a very powerful image, full of emotion and is a close runner-up. Technically the image is well taken, with strong composition and bold, high contrast black and white processing which all work well. Emotionally the image raises questions; who is the boy, where is he… is he locked up or just peering through a fence? Regardless of the answers, I can’t help pick up an expression of resentment in those eyes, eyes that are seemingly more mature than the boy’s years. Because of this the image is slightly haunting. This is a wonderful street style candid portrait of this woman. Her expression is joyful and happy which is beautifully captured. The composition works well and the lighting is pleasingly soft. The background although quite busy is nicely thrown out of focus and the colours are complementary to the woman’s clothes. Personally I would have done a slight crop on the righthand side to remove the front-end of another vehicle as well as perhaps toning down the saturation of the colours to the left of the woman’s head. This is another image full of mystery. The composition and the fact that half the boy’s face is partially concealed by the net curtain make for strong impact as does the high contract black and white processing which really works perfectly. I like this documentary style image of these clown performers. The background reflection adds interest and a second point of view on the scene, while being nicely thrown of of focus by the wide aperture used in this indoor environment; presumably under ambient, artificial lighting. The muted colours and soft contrast processing mirror the tired, dreamy expression of the girl having her hair done.